An excellent Victoria sponge cake recipe will yield a cake that is sweet and light with a smooth, luscious jam-and-cream filling. As with many cakes, the homemade factor makes a big difference here. A store-bought Victoria sponge cake is likely to be overly sweet, with a somewhat gummy texture, but a homemade cake (if made correctly) should be airy and fresh with just the right amount of sweetness. A Victoria sponge cake recipe is only slightly different from a traditional sponge cake recipe or a recipe for sponge cake with cream filling. The essence of the cake is the same, but a Victoria sponge cake has two layers with jam filling between them. Strawberry jam is traditional, but any other type of jam can also be used. Often, the cake will have a layer of fresh cream on top of the jam. The top is left plain but may be dusted with powdered sugar or decorated with fresh fruit. 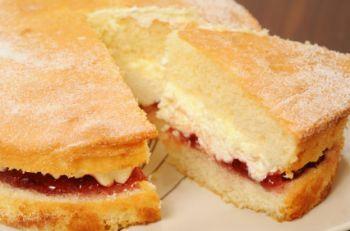 The Victoria sponge cake is named after Queen Victoria, who reportedly enjoyed slices of the cake with her afternoon tea. This recipe yields one sponge cake and is adapted from Nigella Lawson's recipe in the book How to Be a Domestic Goddess. Cut out two parchment-paper circles to fit the bottom of two 8-inch circular baking pans. Lay the circles in the bottom of the pans, and spray the pans with cooking spray or lightly grease them with butter. In a small bowl, combine the flour, baking powder, salt, and cornstarch. In an electric mixer on medium-high speed, cream the butter and sugar thoroughly, until the mixture is light and fluffy. This may take several minutes. Add the vanilla, then add the eggs one at a time. Between each egg addition, put a large spoonful of flour in the batter. When you've added all the eggs, pour in 1/3 of the remaining flour mixture, then 1/2 the milk, then an additional 1/3 of the flour mixture, then the remaining milk, and finally the remaining flour mixture. Mix the batter until smooth and thoroughly combined, but do not over mix. Pour the batter into the two greased baking pans. Bake for about 25 minutes, until the cakes are springy and a toothpick test in the center comes out clean. Cool the cakes completely. After 10 to 15 minutes, remove them from their pans and cool on a wire rack. Whip the heavy cream with an electric mixer until it holds soft peaks. Place one cake layer on a serving platter, and spread the top with the jam and fresh fruit. Pour the whipping cream over the jam and fruit. Top with the second layer of sponge cake, and serve. Soft butter makes a difference for this cake. When used, it will make the end product lighter by allowing more air to be beaten into the initial mixture. Don't soften your butter by microwaving it or warming it in the oven, and don't melt it. Instead, leave it at room temperature until it's soft throughout. Using all-purpose flour works fine for this recipe, but cake flour may yield a lighter, more delicate texture. Instead of jam and cream, fill the sponge cake with lemon curd or another type of frosting. Sponge cake can become stale more quickly than other types of cake, and leftovers (especially from a cake filled with cream) should always be stored in the refrigerator, wrapped tightly in plastic wrap and placed in an airtight container.